If you're searching for Christmas gift ideas for girls, boys (or even moms and dads), I've got you covered! If you're looking for Hanukkah presents, stocking stuffers, or just a present for yourself, I've got you covered there, too. Check out my list of fun toys, collectibles, and unique finds for the holidays! Disclosure: This post may contain Amazon affiliate links. You can read more about affiliate links on my disclosure page. I also received some toys as samples, so I tried to disclose this whenever possible. Rest assured I have played with or seen everything on this list, and I would not recommend something to you if I didn't totally love it myself! You may have seen some of these toys featured in my Top 15 Toy Picks for the Holiday Season, which was a follow-up post to The Toy Insider's HoliDAY of Play. I was recently chosen to be on the Toy Insider Parent Panel, so believe me, I know toys. So to start this off, let me tell you my favorite toy choice for this season! It surprised me, too, but I just absolutely fell in love with Rollie My Kissing Puppy by Moose Toys! I first saw Moose Toy's Rollie My Kissing Puppy at The Toy Insider's HoliDAY of Play. There were three versions of him there (Wrinkles, exclusive to Amazon, and Bella, exclusive to Target). Moose Toys then sent me a sample Rollie to try out, and I just totally fell in love with him! He has over 25 different expressive sounds- he wags his tail, "licks" you, whimpers, sleeps (and twitches and DREAMS while he is sleeping!) just to name a few. I, personally, loved how he could blink his little eyes. My son actually loved him, too, so don't think Rollie is just for girls! Full disclosure: I participated in a paid program through MomSelect on behalf of Ubisoft to review this product, but that in no way influenced my opinion. We truly loved this game and it has become my son's new favorite! I had been hearing great things about Starlink: Battle for Atlas from many of my gamer friends, so I was really excited when I was given a sample starter back to try out (actually, The Jersey Momma's Boy was a little more excited than I was- his first response was, 'Ubisoft makes epic games!'). Starlink is pretty epic. You can travel through exotic alien worlds of the Atlas star system and discover its seven unique planets, each with its own ecosystem, wildlife, and secrets to uncover. The world evolves depending on the player's actions and continues to evolve when you aren't around! How cool is that? Anyway, each Starlink: Battle for Atlas Starter Pack includes a controller mount, which allows you to connect your starship and pilot your controller. You can mix and match weapons, pilots and starships, and even watch the transition seamlessly in your game. You can craft your own starship loadout from your arsenal of wings, hulls, weapons and pilots. You can connect them to your controller mount and see them come to life instantly in the game. There is a two-player split screen option, or kids can play solo. It's great for kids ages 7 and up- especially for those transitioning from "kiddie games" and not quite ready for teenage games yet. This is an open-world game but your child does not interact with online strangers, and there's plenty for them to do within the game so they don't get bored. I was worried that my kiddo would get bored and want another ship immediately, but that has not been the case at all (however, I do like the idea of buying other ships or weapons as future gifts for him! Additional weapons, starships and pilot packs are available at participating retailers). The graphics in Starlink are amazing, and my son says the gameplay is seamless and very easy to use. Starlink: Battle for Atlas is available for Nintendo Switch, XBoxOne and PS4 (we tried out the XBoxOne version). I truly love everything that Kid Robot makes, with Yummy World being my favorite line of theirs. The Yummy World plush are SO adorable, and you can find them in everything from pineapples to Shake Shack curly fries. The scented licorice, jellybean bag and cheesy puffs are my absolute favorites. 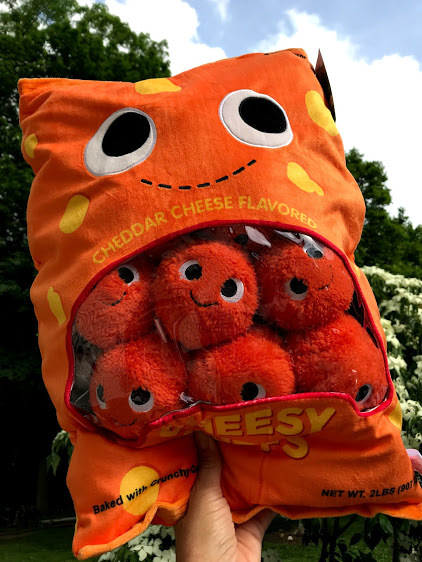 I actually WON the cheesy puffs in a Twitter contest that Yummy World was having, so do yourself a favor and go follow their social media channels! Recommended for ages 0 months and up! If you have older kids who are interested in coding and love Harry Potter, then this is seriously the ultimate gift. It's a bit on the pricey side, but you get what you pay for- you're literally building a wand that responds to you, and learning about coding, too! Truth be told, I am not a huge fan of dolls (gasp! I know, right?). I am more of a stuffed animal kinda gal. BUT Hairdorables are an exception because they are SO cute! I was able to see the whole collection at The Toy Insider's HoliDAY of Play and I can vouch for their sweetness. I love the expressions on their faces and the variety of styles they come in. You can buy them in a blind box and try your hand at collecting all of them- there are over 30! We've tried a lot of different excavation-type toys but Treasure X is our hands-down favorite. Each block contains a little skeleton guy that you have to unearth and then piece together. Somewhere inside, there's also a 'treasure' that you fill with water and watch it foam up to reveal what's inside. There are a ton of different skeletons to collect and they say it's possible you can find an actual gold trinket in there (though that has yet to happen for us!). The newest sets, however, say there is a guaranteed gold trinket inside, so you'll have to let me know if that's true. Either way, they're a lot of fun. After attending Toy Fair New York this year, many toy companies sent me emails about their latest products, and this one really stood out for me. Dude (the game where you say 'dude') is SO fun to play, especially if you're a person who actually uses the word dude a lot (which I tend to do, believe it or not). 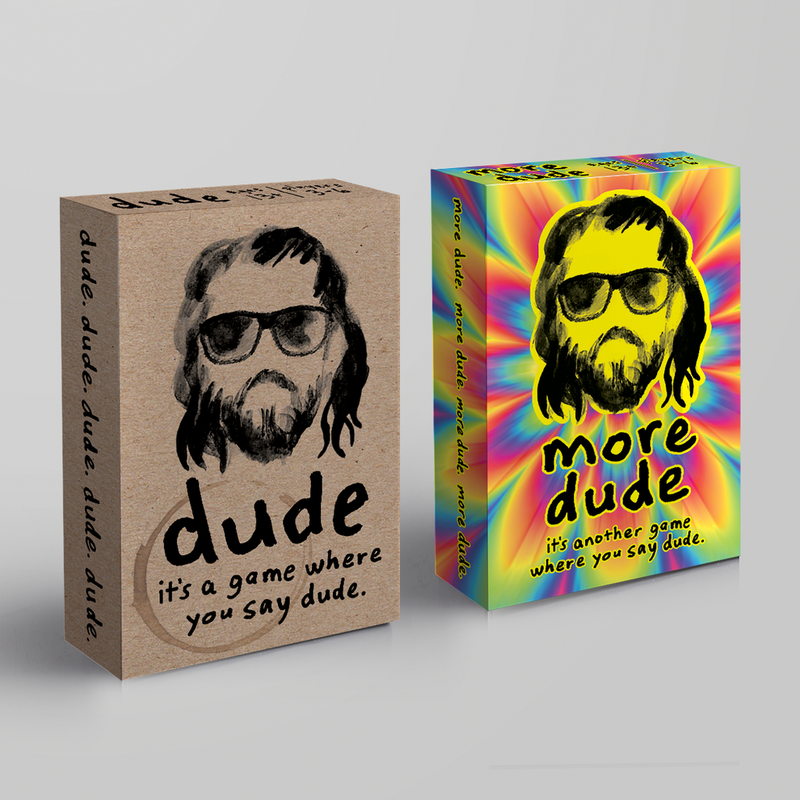 Here are the game instructions straight from the source: 'to play, you say the word "dude" as you think it should be said, based on how it appears on your card. At the same time, listen to how the other players are saying the word "dude." The person who gets the most correct matches is the winner!' If you love it, you can even buy the follow up, 'More Dude.' Many, many thanks to the folks at North Star Games for sending me a sample of Dude and More Dude. You gave us some hysterically funny game nights, that's for sure! Another fun find from The Toy Insider's HoliDAY of Play, When in Rome is a geographic board game that allows your Amazon Alexa device to play as a hostess! It's one of the first games of its kind to use Alexa this way, and I think it's genius. Note that the game does NOT come with an Alexa device. It works with Alexa Smart speakers including Echo and Echo dot, and the Alexa smartphone app. Requires free When in Rome skill for Alexa to play. I already told you that I'm a stuffed animal kinda gal, and Squishmallows are seriously my hands-down favorite these days! You have to pick one up and feel it to understand my obsession. Not only are they cute but they're as soft as a cloud! They make amazing pillows, and can block out sound pretty well, too (I know this because I put one over my ear when Mr. Jersey Momma snores). You can check out my full blog post about all of the latest Squishmallows. You can also find Squishmallows in their online store, or in Walgreens, Five Below, Costco, Shop Rite and various stores throughout the country (their prices tend to be a little higher on Amazon, so be sure to shop around for the best price!). You'll also find them in a variety of sizes and styles (baby, holiday, different animals, etc). Each Squishmallow has a tag with the character's name and qualities on it. Your child can become their own pretend pet groomer with this fun set by Crayola! The little flocked pets are so cute- you can color on them with the special markers and then wash them off in the mini tub. Would also make a fun bath toy, in my opinion! I tried this out myself and it actually works (I was doubtful that the marker would really come off easily, but it did!). These tiny versions of favorite retro toys would make GREAT stocking stuffers! From mini GloWorms to LiteBrites, they're like miniature flashbacks to the 80's and 90's. There's also a mini Polaroid, mini Etch-a-Sketch and mini Care Bears, just to name a few! 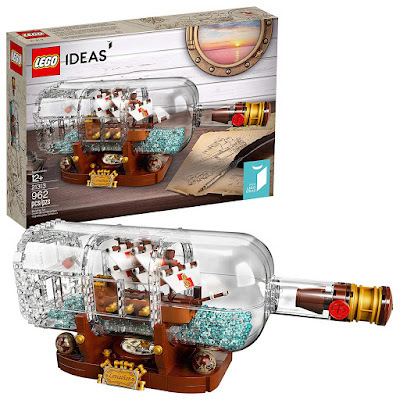 I pretty much love everything LEGO, but their Ship in a Bottle is one of those unique sets that's you'll want to keep on display all the time. My son has his on a table in our hallway, and all of the guests who come to visit comment about how cool it is. It's considered a "hard to find" LEGO set, but you can catch it on Amazon or the LEGO website (look for it in your local LEGO Store, too). It's advertised as a set for adults, but most young LEGO experts won't have any trouble with it, in my opinion. These jewelry pieces are certainly not toys, but if you think your child is ready for some serious jewelry, then this is the collection for you! Rock Love designs gorgeous pieces- I saw them with my own two eyes at New York Comic Con this year. The Disney line is perfect for tweens or responsible young ones - with characters from the Nightmare Before Christmas, Winnie the Pooh, Snow White and The Little Mermaid, just to name a few. Each piece is beautifully hand-crafted. My favorite? Ursula's nautilus shell locket- which opens to reveal little musical notes that you can pull out. Omg! Read more about Rock Love Jewelry in this awesome interview from my friend over at Picturing Disney. There are tons of mermaid sequin toys and items on the market, but I really love Shimmeez plush animals. I first saw them at Toy Fair New York, and they are a bit hard to find unless you've got your eyes peeled for them. You can get them on Amazon but they can arrive kind of smooshed in the box from there (and the prices tend to be higher, too). Try searching the toy section in your local Walmart first! That's where I found the ones pictured below. If you find the 8" size in a retail store, they should average between $8-$10. I wouldn't pay much more for this size unless you're desperate! They also come in clip on size and a larger size, but I've yet to find those in the store. There are a variety of different animals and colors available, too. Check out the Shimmeez website for more details. Another one of my favorite companies, Scentco makes everything scented! Their pillows and backpacks make awesome gifts, and their Backpack Buddies make great stocking stuffers, too! Rescue Runts sure need some TLC! When you first open the package, you'll see that they're in need of some love and attention, so use the included brush and grooming kit to clean them up! They turn from happy to sad in no time! I love that it teaches the value of compassion, too, and caring for something that needs our love and affection. Aren't they just the sweetest? I am a huge Teen Titans Go! fan and I was thrilled to see a screening of the film before it hit theaters. You can check out my spoiler-free review of the movie here. Last month I held a giveaway for the Blu-Ray combo pack thanks to Warner Brothers Home Entertainment. The movie is SO funny, and would make a great addition to any movie collection. This popular book series by Max Brallier is one of our favorites. I featured Max's book series in my post, 10 Book Suggestions for Kids. The book is so popular, in fact, that it's set to become a Netflix series! Better read the books first, right? You can get the boxed set or buy each title individually. It's not scary or gory, and kids will get a kick out of the humor and illustrations. Super for reluctant readers, too! Calico Critters (from Epoch Toys) makes such adorable sets. They can be on the expensive side, but you get what you pay for! The buildings and critters are high quality and meticulously detailed, right down to their fashionable outfits. The Grand Department Store is great because it comes with accessories, furniture, and Stella Bunny. It doesn't come with all of the characters below, but that gives you something to buy for the next holiday or birthday, right? Not ready for the "big" set yet? Calico Critters sells tons of other animals and characters in various set sizes. There's pretty much something for every budget! I debated about not adding Lil' Gleemerz from Mattel to this list because I didn't have a sample at home to try out. That means I can't tell you for certain how all of the features work. But I did get to see them in action at HoliDAY of Play, and I went back to them twice because I liked them so much. I know there are a lot of characters similar to this out on the market, but something about them stood out for me. I loved that there were different styles, and that their eyes and tails glowed in such fun colors. In some of them, the tails actually turned rainbow colors. There were game and party modes, so it becomes interactive (they are supposed to have over 100 reactions). This might be great for kids who are nervous about the dark, too, since Lil' Gleemerz provide such a nice soft glow! 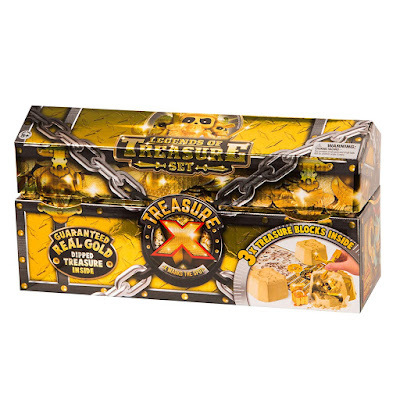 Perfect for budding scientists, this set from Discovery was one of The Toy Insider's hot picks for the holidays. Discovery is a trusted name and you really can't go wrong. There are over 40 experiments included in the set, so it's a great toy for the upcoming winter, too! So there ya have it! 20 gift ideas to get your holidays started! Be sure to check out these other helpful links from my blog, too, including past gift guides and featured toys from shows I have visited. If you need even more suggestions or just want to browse through some more gift ideas, check out my Amazon Affiliate Storefront! All of my suggestions are in one easy place, so grab your pretend shopping cart and mosey on through by clicking the photos below! Happy Holidays!